This volume presents, for the first time in English language, the translation, based on devotion to our Lord Shri Krishna (bhakti), bringing out, from the original Sanskrit text, the "bhavartha" (meaning of the innerspirit and underlying loving sentiments, with which, this treatise has been written), of the monumental commentary Shri Subodhini, on the Maha Bhagavata Purana, by Mahaprabhu Shri Vallabhacharya (c 1479 - c 1531). The tenth canto of Sri Bhagavatam is considered by all Vaishnavas as the most valuable and sacred conto, among the 12 cantos of this Purana - as this canto deals with the divine leelas of our lord Shri Krshna, who is the Shri Purushothama - the supreme lord of the universe. Shri Vallabhacharya Sri Subodhini, is available only for the 1st, 2nd, 3rd, 10th and few chapters of the 11th canto of Sri Bhagavatam. 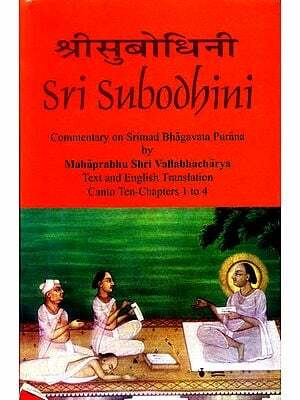 Sri Subodhini is considered as the most detailed commentary, among all the available commentaries, of Sri Bhagavatam. 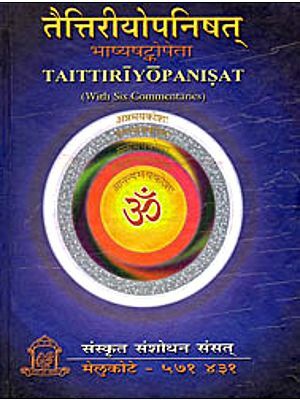 In this volume 6 chapters of the 10th canto are dealt with, with the original verse of Sri Bhagavatam, It's English meaning, the text of Sri Subodhini, in Sanskrit and it's English Meaning. Where ever necessary, the commentaries / explanations given by Shri Gosainji (Shri Vitthalnatha), Shri Vallabhji, Shri Laloo Bhatji and Shri Purushothamji have been also added. The 6 chapters respectively deal with (1) The grace of our Lord on the wives of the Brahmins in Brindavan (2) The worship of "Govardhana" mountain by preventing the "sacrifice" for Indra. (3) The lifting of "Govardhana" mountain (4) The discussion about the "Glory and Greatness" of our Lord between Nandagopa and other Gopas; (5) The holy event of "GOVINDA PATTABHISHEKAM" (coronation or anointing ceremony of our Lord) (6) Bringing back Nandagopa from the world of Varuna. Born in a village, founded by Adi Shankracharya, as the son of every devout parents, the late T.K. Viswanatha Iyer and Ranganayaki Ammal, Ramanan was initiated into the study of the Vedas, the Upanishads, Puranas, the Gita, Sanskrit treatises and the Sacred Chantings from the age of 5. His initiation into the path of Bhakti was blessed by his Acharya and Guru, Shri Ubhaya Vedanta Srirangam Sampath Kumara Swami, who is 77 now and is a symbol of our Lord's love and compassion. He is honoured and loved by everyone, as a noble Saint of Shri Ramanuja Sampradaya. Arising out of a chance meeting with one of the greatest saints of our times, Shri Shyam Manohar Goswamijee, a direct descendant of Shri Mahaprabhu Vallabhacharya, becoming the recipient of His love, Grace and Compassion, Ramanan was inspired to attempt writing this translation into English of the monumental commentary of Shri Subodhini, by Mahaprabhu Shri Vallabhacharya, which in the words of Srimad Andavan of Srirangam, a noble and most loving Saint of the Ramanuja Sampradaya "cannot be fully and truly translated, into any other languages, as Shri Vallabhacharya had the highest love for Lord Krishna". Hence, at best, this translation, in the words of Ramanan "is a humble attempt to becoming deserving to get the Grace of our Lord Shri Krishna, through the Blessings and Grace of my Gurudeva Shri Ubhaya Vedanta Srirangam Sampath Kumara Swamin, Shri Shyam Manohar Goswamijee, Srimad Andavan of Srirangam and all Devotees and Bhaktas of our Lord".